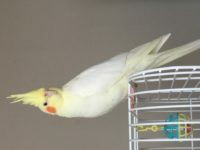 Astro might be a female, she is a friendly bird, Beautiful white with yellowish color on her chest and tail. She prefer to fly to male and sit on the shoulder. She is two years old. A greyish color on her tail because of dust, since she likes to hide and ptay on the top of the china cabinet.